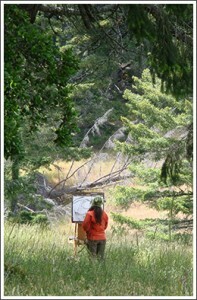 Founded in 2006, the San Francisco Studio School is dedicated to the study and practice of the visual studio arts. It offers courses, workshops, seminars, and an online program in drawing, painting, photography and mixed media. Both art students and emerging artists are supported. The school was co-founded by the principle faculty, Laura Harden and Lon Clark, who are committed to the teaching of visual language, developing personal expression, acquiring relevant techniques and a contemporary understanding of visual art. In addition to its curriculum, SFSS has curated exhibitions of painting, drawing and photography, held symposiums, and presented speakers on a variety of subjects. Semester offerings for the 2017-2018 academic year will be held at Fort Mason Center. Former SFSS photography student, McNair Evans wins 2016 Guggenheim Fellowship in Photography.